One of the most beautiful and storied college campuses in America can be found at The Citadel. It is a remarkable spectacle – located along the scenic Ashley River with statuesque buildings, uniformed cadets on parade, booming cannons, and a tradition of military service comparable to West Point and Annapolis. 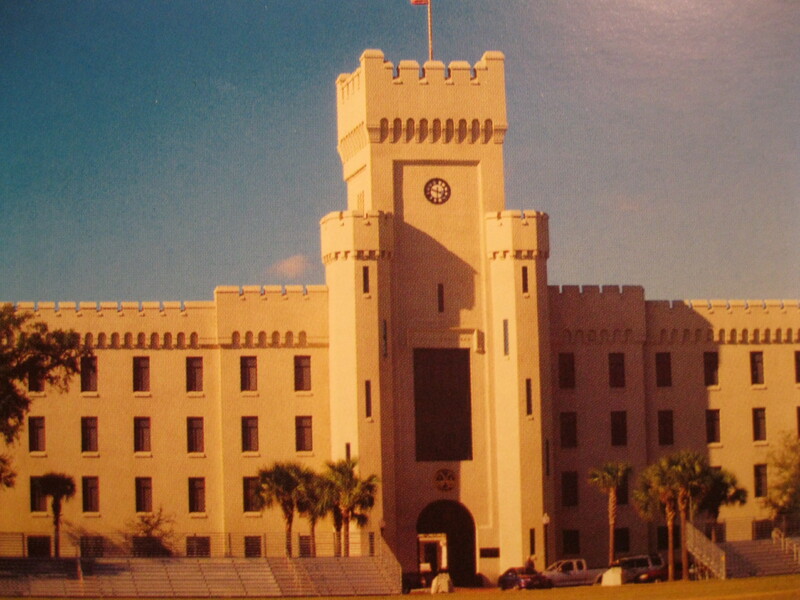 Founded in 1842 as the South Carolina Military Academy, the military school was first located in downtown Charleston at Marion Square, but moved to its present location in 1922. The grandeur of the crenelated barracks along the famed Avenue of Remembrance is lined with military aircraft, tanks, missiles and guns, symbolizing the service of Citadel Cadets from the Civil War to the present. One of the truly hidden gems of Charleston is the Citadel Museum on campus, featuring artifacts, pictures, uniforms, weapons, medals and momentos throughout the school’s highly-decorated past. One of the most amazing displays is the giant “Stainless Banner” that flew over the garrison at fortifications in Charleston Harbor, where Citadel cadets distinguished themselves as expert artillerists, commanding guns that helped keep Charleston uncaptured throughout the Civil War. Best of all, the Citadel Museum and a visit to the campus is completely free. Simply drive in and enjoy the spectacle of Summerall Field and the Avenue of Remembrance, where Friday afternoon parades are very popular. To find out days and times of the parades, go on line at www.citadel.edu › Home › Visit The Citadel. The proposed new Clemson Architectural Center in historic Ansonborough is an atrocious design that resembles a sagging mattress made of glass. The defenders of this design say this is consistent with traditional Charleston architectural innovation, but that is simply not true. 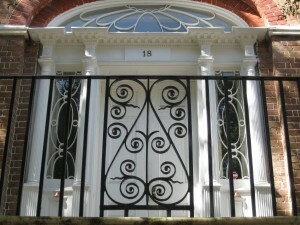 Charleston is graced with classic designs such as the details shown here of the William Blacklock House on Bull Street. The Blacklock house was built around 1800 in a style that was innovative for its day – the Adam style that is also know as Federal style. Rather than deviate from tradition, the Adam style enhanced it, with elaborate detail meant to show off the skill of artisans in wood, iron and plaster. The brothers Robert and James Adam patterned the style after the beautiful details of late Roman and Greek classics, such as the Pantheon, where aesthetics were considered the ultimate in building achievement. There is nothing aesthetic about the proposed Clemson structure, which is bulky, boxy and totally out of character with the historic Ansonborough neighborhood, which was mostly built in Greek Revival style after the Charleston fire of 1838. 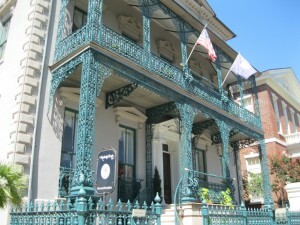 One of the greatest buildings in Charleston history was built just down the street in 1839 – the grand Charleston Hotel. That exquisite structure, with its 14 two-story Corinthian columns on a massive raised basement, was destroyed in 1962 to build another “innovative” building, the squat brick Heart of Charleston Motor Hotel. The old city should have learned a lesson then, and fortunately, the Clemson center was not built. Charleston SC is blessed with just about everything appealing to visitors, and is a great place to tour in October. The beaches and barrier islands are beautiful this time of year with Monarch Butterflies and sea oats swaying above sand dunes. Golfers love the championship courses that have views of ocean front, tidal creek and maritime forest. 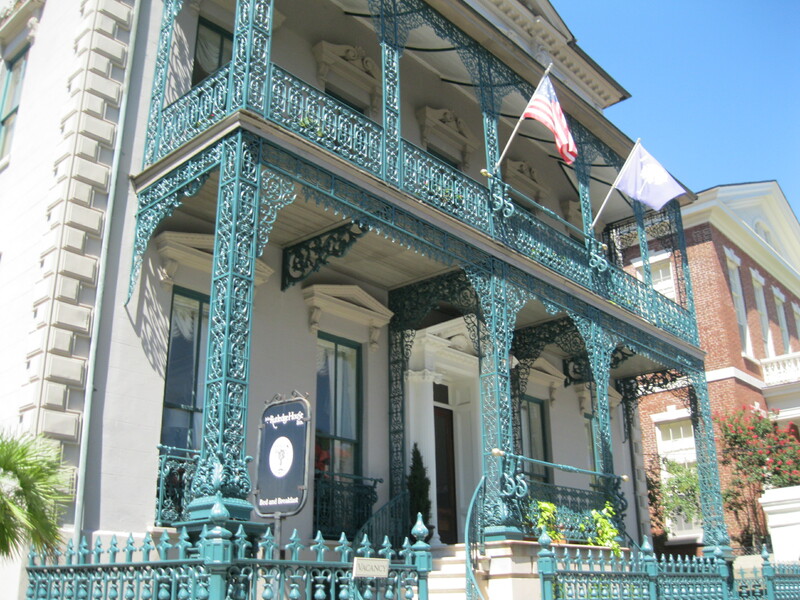 Excellent restaurants are everywhere and not as crowded this time of year, there are outstanding hotels and inns, such as the Rutledge House Inn(pictured) at 116 Broad Street, once home to Constitution signer John Rutledge, and the Simmons Bed and Breakfast at 15 Church Street, located in a wonderful antebellum house that was once home to noted Charleston philanthropist Amarinthia Yates Snowden. Of course, it’s a great time to see plantations, museum houses and local parks, and all are hopeful that government issues get sorted out to reopen the gates at Fort Sumter National Historic Site. The Preservation Society of Charleston is currently hosting its annual Fall Tour of Private Homes and Gardens, and the Dock Street Theatre is offering a Charleston Stage production of Sherlock Holmes. With moderate temperatures and long days of sunshine in this shoulder season, it’s an ideal time to join me on a walking tour or just to wander the scenic streets of this elegant, historic city. Enjoy the Fall blooms such as Cassia and Plumbago, watch the talented Sweetgrass weavers work their magic with colorful baskets, marvel at the grand church steeples, the intricate wrought iron, the fables cobblestones, and the distinctive piazzas and porticoes. There are miles of contiguous historic district with opulent houses and flourishing gardens, a grand waterfront promenade along the famous Battery witnessing Charleston Harbor filled with dolphins, sailboats and pelicans, and a welcoming attitude among Charlestonians known for their gracious Southern hospitality. The tallest residence in Charleston’s was the Francis Rodgers Mansion on Wentworth Street, now a hotel known as the Wentworth Mansion. 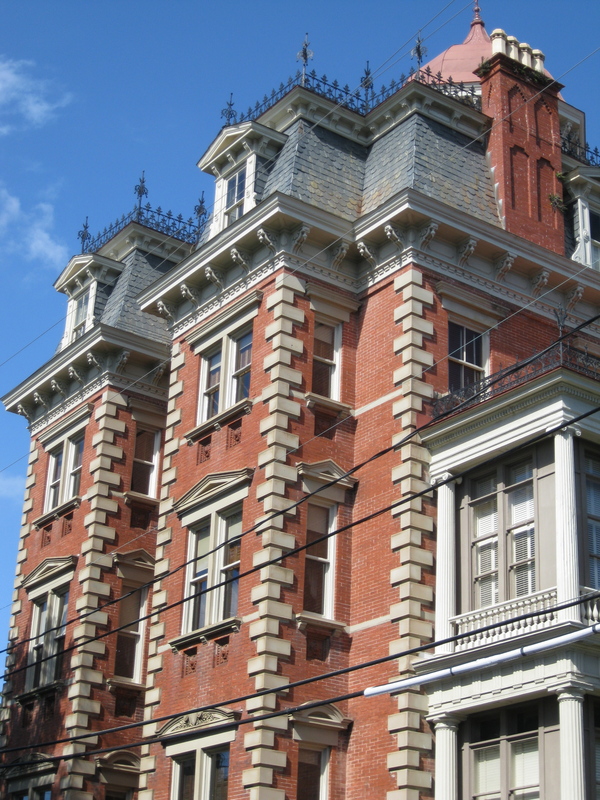 Completed in 1887, the 14,000 square-foot, four-story home was built with lofty ceilings on a raised basement and included a rooftop cupola, and today stands over 100 feet. The architect was Daniel Wayne, who also designed the first public fire houses in Charleston, all of which still stand, and were a passion of Rodgers. who was a city councilman in the 1880’s when the city fire department was organized. Wayne’s emplyer, Francis Rodgers, was a wealthy Charleston businessman who had a very large family, thus the big house, and who was obsessed with protecting the city from flames, thus the rooftop cupola. Rodgers apparently enjoyed viewing the city from his roof and surveying the landscape for any sign of fire. During his residency in the house, which lasted until World War I, the biggest flame and smoke witnessed from the roof was the celebratory fireworks over at Colonial Lake, which was made into a public promenade in the 1880’s and became noteworthy for public events and spectacles. Today the guest at the Wentworth Mansion can enjoy the same magnificent view from the old cupola, and look out over a city that greatly benefitted from the influence of Francis Silas Rodgers. 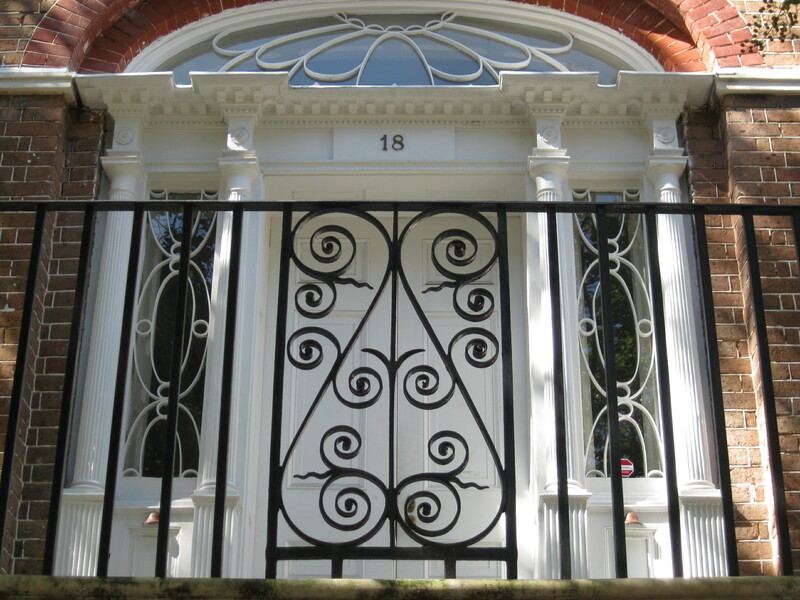 The influence of 18th-century Scottish architect James Gibbs can be found throughout Charleston, although few in this city have ever heard of him or give him credit for his distinctive style. Gibbs, like many architects of his day, was dedicated to incorporating ancient Roman and Greek styles into his buildings, and became a proponent of Mannerism, which put great emphasis on symmetry and spatial relationships in parts of the buildings. His classic work was St. Martin-In-The-Fields in London, which set the standard for American Anglican church architecture. Gibbs broke from earlier English tradition and placed his steeple behind the grand portico of the church to accentuate the spatial relationship between the upper and lower details of the building, and this steeple-portico arrangement can clearly be seen in St. Michael’s church in Charleston. It’s obvious that Gibbs’ 1728 book of architecture was used to copy the design for St. Michael’s exterior, and ironically, over at St. Philip’s church, the interior is a dead-ringer for St. Martin-In-The-Fields. One of Gibbs’ trademark details is the space between elaboration in arches that is clear in St. Philip’s interior. 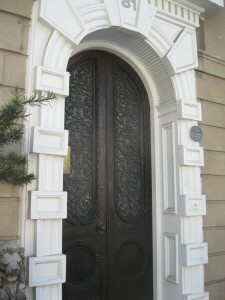 This look of separate block details surrounding doors and windows is actually named after the famous architect, and is called a “Gibbs Surround”. Look at classic buildings throughout historic Charleston, and you will find yourself literally “surrounded” buy the influence of James Gibbs, who, by the way, never visited Charleston. 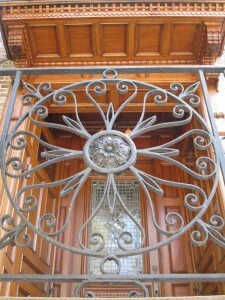 Some of historic Charleston’s most beautiful architectural details can be found on streets rarely wandered by tourists. 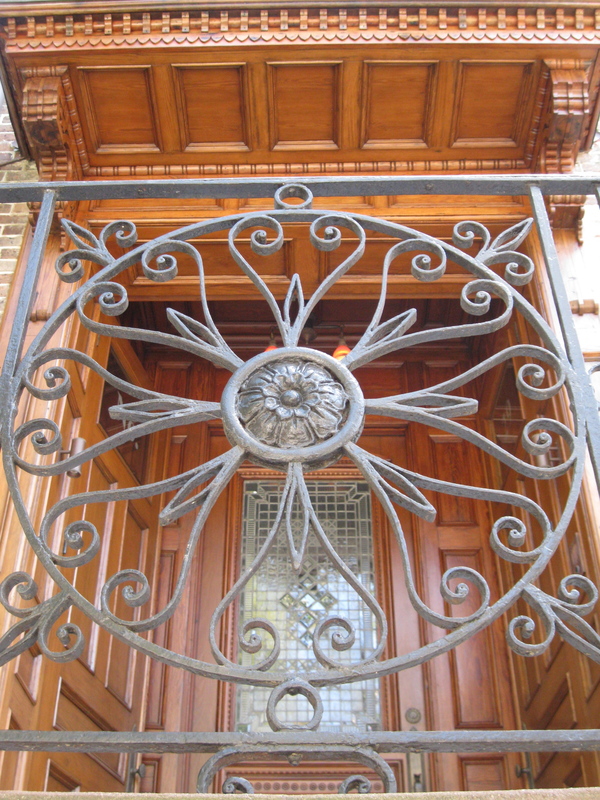 Over in Harleston Village, on streets such as Montagu, Bull, Smith, and Pitt, there are exquisite works in wrought iron, plaster, brick and wood that have stood silently for centuries in one of Charleston’s least-traveled locations. The neighborhood dates back to the 18th century, and was officially laid out as the Village of Harleston shortly before the Revolutionary War. At that time, the streets bordered the marshes of the Ashley River and Coming’s Creek, and opulent houses were built by planters and merchants hoping to enjoy the breezes and wetland scenery. By the 1880’s, Coming’s Creek was a memory, filled in to create the thoroughfare now called Rutledge Avenue, and it’s easy to see the rise and fall of the street’s contour that follows the old wetland areas. Harleston Village fell on hard times after the Civil War, and many grand old homes fell into disrepair and some were lost. Others, such as the magnificent Isaac Jenkins Mikell house on Rutledge, barely passed the wrecking ball and survived as home to the Charleston Library Society from 1935-1960. Since the 1980’s, Harleston Village has enjoyed a beautiful restoration, and the old homes are grand once again, and are an inviting spectacle for visitors wishing to see Charleston off the beaten path.